Rinpoche is currently teaching during the Kopan November course at Kopan Monastery, Kathmandu, Nepal. The annual long life puja offered on behalf of all Rinpoche’s students, centers and projects will be offered at Kopan on Dec 8th. Rinpoche will attend the teachings of His Holiness the Dalai Lama which FPMT is co-hosting in Sarnath, India from Dec 19 – 21st, and then will participate in the FPMT Geshe Conference which follow Dec 22nd – 24th. From there Rinpoche goes to Root Institute, Bodhgaya to lead a short Maitreya retreat, Dec 27th – 31st. Rinpoche will then give a public talk hosted by Tushita Mahayana Meditation Centre in Delhi on Jan 2nd, 2007. As soon as we have more details about Rinpoche’s teaching schedule we will let you know. “The most important thing for success is devotion and compassion – this is the cause for harmony. That’s the best puja. Compassion for others cuts down on problems, and people will help you. 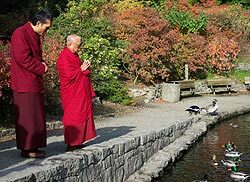 For an amazing and incredibly inspiring and enjoyable scroll through Rinpoche’s life in pictures, please have a look at the new Photo Gallery at https://fpmt.org/teachers/zopa/gallery/ where there are thousands of photos of our kind and tireless spiritual director. Coming soon – students with MP3 players will be able to receive Lama Zopa Rinpoche teaching podcasts! Audio teachings by Lama Zopa Rinpoche have been available in MP3 format for some time via FPMT Audio Teachings, and we are adding to this service by making available all new teachings by Rinpoche which are sent to Lama Yeshe Wisdom Archive in MP3 format. LYWA are working on adding all of Rinpoche’s teachings pre-Sept 2005 to their audio page. 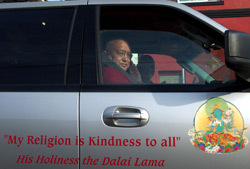 Rinpoche’s car says it all! “Because we and all beings still live in samsara and have anger, attachment, ignorance and all the mental garbage: having all these wrong views is why we need Dharma centers, which are a place to learn, to practice, to purify and collect merits, to inspire each other, to develop wisdom and compassion and to achieve liberation and enlightenment. Because we are in samsara and because we have problems that is why we need Dharma centers, that is why Dharma centers exist. “I hope everything is ok with you, I hope you are not in the part of New York where there is no electricity for many weeks; even when there is no terrorist problem, still there are problems. Happiness and suffering come from your own mind, not from outside. Your own mind is the cause of happiness; your own mind is the cause of suffering. To obtain happiness and pacify suffering, you have to work within your own mind.